by C.F. Baker, B. S. Braid, R.A. Dew, and L. Lance, pp. 1-6. This report correlates the numerical evaluation of the Reich Blood Test with a number of disease states and several normal conditions. The former range from benign tumors and dysplasia to ulcerative colitis, inflammatory diseases, lymphomas, and carcinomas. Typical test results are given, illustrating change as the disease progresses or with various treatment regimens. Included is a discussion of the GMA and delta-49 as early, sensitive indicators of pathology. by C.F. Baker, R.A. Dew, M. Ganz, and L. Lance, pp. 7-24. In this paper, the results of seven years of experiments using orgonotic devices to influence the rate of wound-healing in mice are presented. Findings demonstrate that the healing rate is regularly increased by both the orgone energy accumulator and medical DOR-buster; and the results are statistically significant at the level of P < 0.002 or better. Included are discussions of methodology and the development of device modifications and assessment of their relative effectiveness, as well as seasonal patterns in the action of the devices. 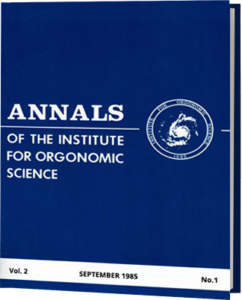 This study represents one of the first statistically rigorous demonstrations of the biological activity of orgone energy devices. by C. F. Baker, pp. 25-32. The atmospheric pulsation of the orgone energy can be measured in many ways. In this paper, the results of several different techniques using the electroscope and orgone accumulator temperature difference as monitoring parameters are presented, as well as confirmatory findings from the wound-healing experiment. The data is consistent in finding an antithesis between the movement of energy between air and water, demonstrated both in the atmosphere and by various experimental devices such as the orgone energy accumulator and medical DOR-buster. by C.F. Baker and L. Lance, pp. 33-37. The authors discuss the orgonomic concept of health, and the irrational tendency of some patients in orgone therapy to mystify orgonomy and project idealized concepts of health onto their therapists. Ways of addressing these problems during treatment are also explored. by M. Ganz, pp. 38-44. The author describes the successful treatment of a 33 year-old male who presented with a history of erectile impotence and sadistic sexual fantasies. The edited material from training seminars of the Institute presented in this column is intended to provide the readership with information on the theory and practice of orgone therapy. In this installment, eleven orgone therapists continue discussion of the ocular armor segment. by P. S. Burlingame, pp. 53-59. This column is intended to encourage “ hands-on” experience with various aspects of Reich’s biological and physical laboratory findings, particularly for interested readers with limited means or access to sophisticated equipment. In this installment, the author describes how to construct a gold leaf electroscope using a glass jar and reviews classical and orgonomic explanations of electroscope functioning. The use of the electroscope to demonstrate the diurnal variation in discharge rate, and the effects of relative humidity and different weather states on discharge rate is also discussed.